The Raspberry Pi Zero and Pi Zero W feature a USB OTG port, allowing users to configure the device as (amongst other things) an Ethernet device. 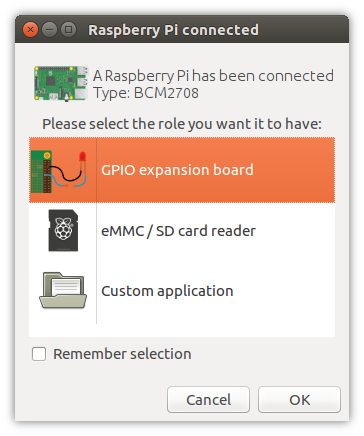 In this mode, it is possible to control the Pi Zero’s GPIO pins over USB from another computer using the remote GPIO feature. The GPIO expander method allows you to boot the Pi Zero over USB from the PC, without an SD card. Your PC sends the required boot firmware to the Pi over the USB cable, launching a mini version of Raspbian and booting it in RAM. The OS then starts the pigpio daemon, allowing “remote” access over the USB cable. At the time of writing, this is only possible using either the Raspberry Pi Desktop x86 OS, or Ubuntu (or a derivative), or from another Raspberry Pi. Usage from Windows and Mac OS is not supported at present. Download an ISO of the Raspberry Pi Desktop OS from raspberrypi.org (this must be the Stretch release, not the older Jessie image). Write the image to a USB stick or burn to a DVD. Live boot your PC or Mac into the OS (select “Run with persistence” and your computer will be back to normal afterwards). It will take 30 seconds or so to flash it, then the dialogue will disappear. Raspberry Pi Desktop and Raspbian will name your Pi Zero connection usb0. On Ubuntu, this will likely be something else. You can ping it using the address fe80::1% followed by the connection string. You can look this up using ifconfig. Alternatively, you can set the pin factory in-line, as explained in Configuring Remote GPIO. Read more on the GPIO expander in blog posts on raspberrypi.org and bennuttall.com. The legacy method requires the Pi Zero to have a Raspbian SD card inserted. Edit config.txt and add dtoverlay=dwc2 on a new line, then save the file. Create an empty file called ssh (no file extension) and save it in the boot partition. Edit cmdline.txt` and insert modules-load=dwc2,g_ether after rootwait. Then connect the Pi Zero to your computer using a micro USB cable (connecting it to the USB port, not the power port). You’ll see the indicator LED flashing as the Pi Zero boots. When it’s ready, you will be able to ping and SSH into it using the hostname raspberrypi.local. 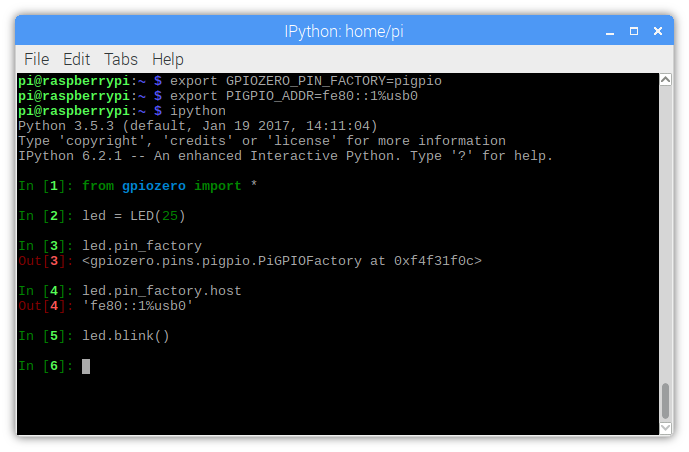 SSH into the Pi Zero, install pigpio and run the pigpio daemon.